Rory McIlroy might be the centre of attention at the Masters this week, but Cavan golfer Leona Maguire has an equally stellar pedigree and the talent to become a superstar of the women's game. The 24-year-old from Ballyconnell, who along with her twin sister Lisa has been smashing records and racking up titles since she was just 10, won her first professional title in a playoff in California on Sunday night. Add to that the fact that she's managed by Niall Horan's golf management group Modest Golf and it appears her career is only going in one direction - to the very top. "I will take it one event at a time and one shot at a time, but the dream is to be the best player in the world," she said when she turned professional last June. "I got to number one in the amateur rankings so there is no reason why I can't have the same goal." As Lisa, the more dominant of the twins early in their careers, battles to rediscover her very best form, Leona took a giant step towards making it to the LPGA Tour in the US on Sunday. She won the Windsor Golf Classic near San Francisco after a sudden-death playoff, banking €22,500 to soar to the top of the Symetra Tour money list. The top 10 from that tour at the end of this season will automatically be promoted to the megabucks LPGA Tour next year and Leona, whose trophy was a three-litre bottle of wine provided by the sponsors, is thrilled she's achieved the first step on the road to the top. "This year has been nice, working my way into the season with some really good finishes and trying to get better every week. I knew I would get there eventually, took a little longer than I would have liked but it's a great feeling," she said. She's spent the past 10 weeks on the road - travelling from Ballyconnell to Dubai, Australia and Florida before finally making the breakthrough in California. 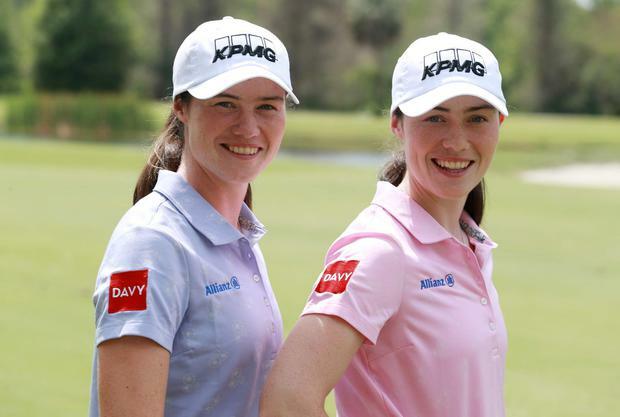 She'll be back in Cavan later this week, stopping off in Phoenix for an equipment check with club sponsors PING - one of a raft of blue-chip deals the twins have signed since they turned professional last June. They also have contracts with KPMG, Allianz, Puma Golf, the Davy Group and the Slieve Russell Hotel Golf & Country Club, while Leona promotes Red Bull and acts as an ambassador for the 20x20 campaign that promotes women in sport. Leona's rise to the top is no surprise given her incredible college career on a golf scholarship at prestigious Duke University, in North Carolina, where Lisa was also a member of the golf team. The daughters of schoolteachers Declan and Breda Maguire, they were academic high-achievers and got stellar Leaving Certificate results at Loreto College, in Cavan, before being headhunted by Duke, where they got first-class degrees. Leona was just as outstanding on the golf course as in class, and finished with the best scoring average in women's collegiate golf history. She also appeared alongside Pádraig Harrington, Seamus Power and Stephanie Meadow in the 2016 Olympic Games in Rio. They followed their father Declan into golf and never looked back, and while their careers are moving in different directions, for now, they remain inseparable friends. "A lot of people around here joke that we're twin one and twin two," said Lisa, who caddied for Leona for two weeks recently. "We call it a built-in friendship." If she makes it in the professional ranks, Leona could make millions in prize money and endorsements, but she's simply determined to climb the ladder for now and sees Annika Sorenstam and boxer Katie Taylor as role models. "What Katie has done has been a huge inspiration for a lot of people in Ireland, the hard work and still being humble and down to earth," Leona said. Lisa added: "It'll be pretty cool if the girls, the six, seven, eight-year-old girls could look up to people like us in a couple of years." Gordon Deegan A pub has agreed to pay €3,500 compensation to a man with a brain tumour after it ordered him to leave the premises.